The shooting death of Michael Brown in Ferguson, Missouri, reignited a long-smoldering movement for justice, with many St. Louis-area clergy stepping up to support the emerging young leaders of today’s Civil Rights Movement. Seminary professor Leah Gunning Francis was among the activists, and her interviews with more than two dozen faith leaders and with the new movement’s organizers take us behind the scenes of the continuing protests. Ferguson and Faith demonstrates that being called to lead a faithful life can take us to places we never expected to go, with people who never expected us to join hands with them. Ferguson and Faith is the first book from the partnership of the Forum for Theological Exploration (FTE) and Chalice Press. "Leah Gunning Francis’s conversations with both the clergy and the young activists show how important it is for communities of faith to reach out to a new generation of young leaders and help elevate and nurture their gifts. 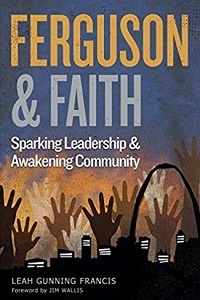 What many of the clergy interviewed in this book realized in the course of the Ferguson protests was that rather than sitting back in their sanctuaries and waiting for the young people to seek out the church for guidance or leadership, it was the church that needed to go out and meet the young people where they were, joining them shoulder to shoulder, on the streets, in the struggle for justice."